On the second Wednesday morning of every month, you can normally find me and about four or five of my colleagues cooking breakfast at Interfaith Partnership for the Homeless (IPH). We arrive early, between 7:00–7:30 a.m., but much of the work occurred the night before – shopping; precooking pounds of bacon, sausage, potatoes; and printing out order forms. Throughout the morning we crack and cook about seven dozen eggs, whip up French toast using homemade challah, recreate the famed “creamy, dreamy grits” from Atlanta, Georgia and prep plates for the order forms. 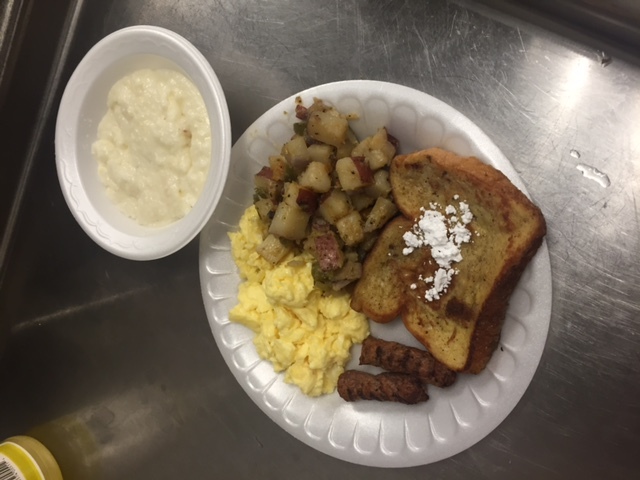 It is not everyday that the guests at IPH receive a made-to-order hot breakfast, but once a month PRA makes it happen. Guests can choose from a number of different breakfast items, all of which are served to them (no buffet here! ); then after all the cooking is finished, our staff takes some time to eat with the guests and get to know them. It’s amazing what you can learn about someone’s life while sharing a meal. At PRA we work on the “technical” or “systems” level side of homelessness, veteran’s issues, and criminal and juvenile justice, and we don’t typically interact with the populations that we work so hard to serve; that is what makes these meals so special. But it’s not just breakfast! PRA is a community-focused organization and we really strive to give back. In addition to the monthly breakfasts we also cook and serve a bi-monthly dinner; my éclair dessert is always a big hit, but so are the ribs, fish, salad and vegetables we serve. In the winter, IPH also operates as Safe Haven shelter, where anyone can have a warm place to stay for the night; however Safe Haven guests, do not typically receive the amenities associated with staying at the main shelter. Due to this, as part of a division retreat this past winter we put together and a number of bags filled with toiletries, socks, gloves, and candy and donated them to the guests at Safe Haven. Giving back is also never far from our minds when we are traveling for work; as a “frequent traveler” I stay in many hotels, but almost never use the mini soaps and shampoos. Instead of leaving them I pack them up every night and by the time the trip is over I typically have a bag full of toiletries ready to be donated. This has even spilled over to my personal travel, you’ll find me stowing away mini shampoos like a squirrel does nuts! One of the most powerful contributions we have been able to make through our connection with the local homeless shelter has been our ability to work with individuals to apply for SSI & SSDI. Over breakfast conversations we have been able to identify those in need and assist them using the SOAR (SSI/SSDI Outreach, Access & Recovery) process. So not only do we get to enjoy a meal with these new friends, our efforts have resulted in four formerly homeless individuals how receiving income and moved into stable housing (with more cases pending).